Courtesy of Rabeling & Verhaagh/PNAS. Used with permission. 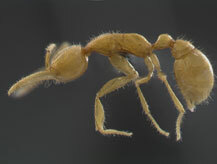 The recent description of the new and unusual ant species from Brazil Martialis heureka, caused furor in the popular media. It was entertaining to watch how, like the children’s game of Chinese whispers, the report rapidly deteriorated and became increasingly sensationalistic as it spun through news agencies around the globe. Reports ranged from accurate and informative to down right silly, with some newspapers almost claiming that the species actually originated in Mars (You can read more about it at Myrmecos blog and comments therein).